*Redesigned base circle for higher lifts. *Standard NA8C HLA (Hydraulic Lash Adjuster system) can not be used. *Locked Lash Adjuster KIT or Inner-Shim Conversion KIT required. ♦Standard NA8C ECU can be used. ♦Standard NB8C ECU can be used. *In some cases the cylinder head may need modifying due to the high lift cam making contact with the lifter hole of cylinder head. 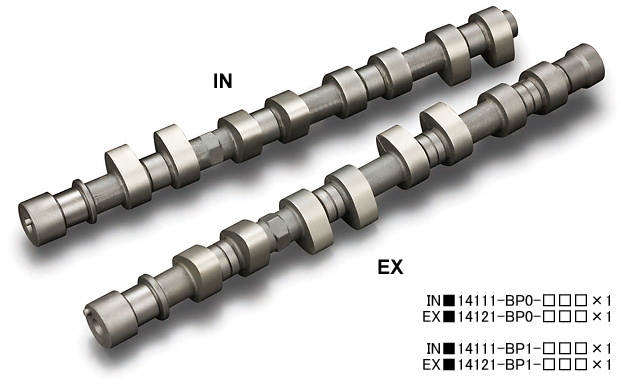 *Inner Shim Conversion KIT (14730-BP0-001) required. *Base circle reduced in size to achieve higher lifts, but still using the same diameter cam follower.